'The Lost Sheep' Wicklow' The Genius of Van Der Putten in Co Wicklow, Ireland. Superb Painting by Daniel Van der Putten. This is a beautiful Painting of one of Ireland's most beautiful areas. In December 2018 the heavy Snow made for a winter wonderland. Daniel Van Der Putten is Dutch born but resides and paints in the UK. Exhibited only in the finest Galleries, it is a great honour to have a Van Der Putten in my Gallery and to have the only Painting of a winter Wicklow wonderland as the farmer serches for his sheep by Van Der Putten is a very rare honour. 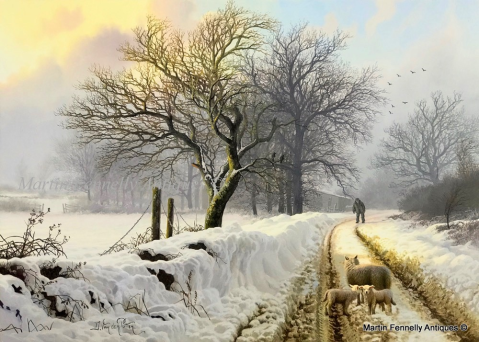 Van der Putten's majestic brush work captures with consummate finesse the Magic of this rural scene and his Shadow and Light work on the Snow is Superb. The Painting is framed in a fine quality Gilt Frame.